If you have walked through the churchyard you may have noticed a slate poppy placed next to some of the headstones, and that their numbers have been increasing over the past 4 years. These are part of ‘Remembering the Fallen of the Great War at Christ Church’ and they are placed there on the centenary of their death when their story is put on display. 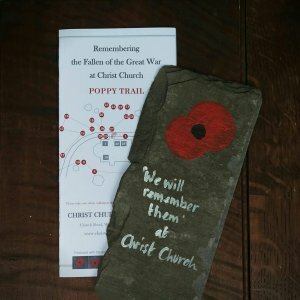 We have created a Poppy Trail leaflet to help guide you through the churchyard to see the memorials and to those within Christ Church. This free leaflet will also share a little of the stories of these 29 men who lost their lives in the First World War, with their story in full on display inside Christ Church. The Poppy Trail leaflet has been produced with the support of the Powys War Memorials Project of which we are very grateful.